The fish had tumors. The Black River was poisoned. Thirty years ago, the Environmental Protection Agency declared this tributary of Lake Erie in northeast Ohio a bio-toxic ‘area of concern,’ an official designation that a region is unable to support wildlife because of human activity. This meant disaster for the city of Lorain, which sits on the edge of Lake Erie and is bisected by the Black River. Hit hard by the successive loss of two major industries — shipping in 1984 and a Ford plant in 2005 — the city of roughly 60,000 finally decided to ‘take back the Black.’ It has been a long, hard fight to save the river that runs through the heart of the city, but hope is in the air. That effort recently received a boost. In September the EPA approved a $15 million grant that holds a promise of new life for both Lorain and the Black River. It is the largest single grant awarded by the EPA to an area of concern as part of the Great Lakes Restoration Initiative. The grant funds four projects that will remove contaminated soil and restore the waterfront of the river along an old steel plant in Lorain. Locals hope the restoration efforts will create jobs and revitalize Lorain’s economy. “In order to bring people back, we have to have something to bring them back to,” says Kathryn Hoffmann, Lorain’s storm water manager, who is heading the restoration. The project focuses on land along the river that was once a trash heap for a steel mill. In Hoffman’s initial investigations, she found that the dirt that remains is full of chemicals that are leaching into the groundwater. Comprised of lime, hydraulic fluid, oil and old steel drums, this contamination is one of the lingering sources of pollution along the Black River. Lorain has benefitted from the EPA’s new focus on restoring ecosystems along the Great Lakes. But Lorain had to take the initiative to get the money. “The fact that the city was primed to do this work was the driving force,” says Anne Rowan, an EPA spokeswoman. She says most EPA grants are much smaller because areas don’t have the ability or commitment to undertake such large projects. These projects will get the Black River “across the finish line,” says Marc Tuchman, who works on soil cleanup projects at the EPA’s Great Lakes National Program Office. Most of the cancer-causing contaminants were dredged out of the Black River in the ’90s, which reduced the danger of the river to local residents. And local citizens have gotten directly involved. The Lorain County Kayak Club, for example, has spearheaded efforts to remove trash and debris from the river itself. Removing the last of the contamination, adding fish shelves — shallow underwater regions to help fish to breed — and other ecosystem support should give the Black River a new start. “Drawing people to the river draws people downtown,” says Hoffmann. She and other members of the city are hoping the restoration will fuel the city’s eco-tourism industry, which would provide a new source of income for its residents. And Lorain residents desperately need a new source of income. 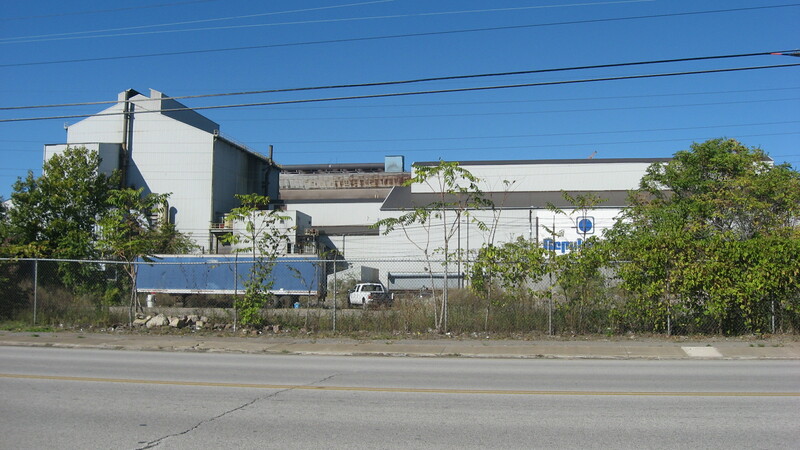 In 2015, 325 workers were laid off from Lorain steel industries, and 461 more workers will be laid off this spring according to an announcement in January. Luckily, studies of urban green space over the last 10 years have shown that adding green space to a city directly benefits its economy. “It broadens our idea of what restoring the local economy really means,” says Sarah Dooling, an urban design professor at the University of Texas, Austin. When cities add green space, they increase the property values of surrounding neighborhoods, and draw more people to the area. But increased property values can cause problems for low-income residents, like the High Line in New York City, where increased property taxes forced residents to leave newly restored areas. So far, though, Lorain has only seen the benefits of the restoration of the Black River. “Can it create jobs? Yeah, it can create jobs,” says Leon Mason, Lorain’s head of community and development planning. Mason says the city has already felt the benefits of the restoration. “On the waterfront, it prevents deterioration. Nobody wants to go where things are deteriorating.” In Lorain’s city center, which features an open-air concert venue and where the waterfront has already been restored, a new wave of tourists has flowed in. Wonderful piece. I think it’s so exciting that the entire community is involved in this endeavor. If there’s a community that is worthy of the funding, it’s Lorain. Thank you for bringing this story to our attention!